This video will introduce you to adding images to use the ‘Image Gallery’ feature. The ‘Gallery’ option in WordPress lets you post a collection of images as thumbnails into your post. To create a gallery from the ‘Post Editor’ click the ‘Add Media’ button. Under the ‘Insert Media’ menu click the ‘Create Gallery’ option. Under the ‘Insert Media’ menu click the ‘Create Gallery’ option. Select the images you want to include and then click ‘Create a New Gallery’. 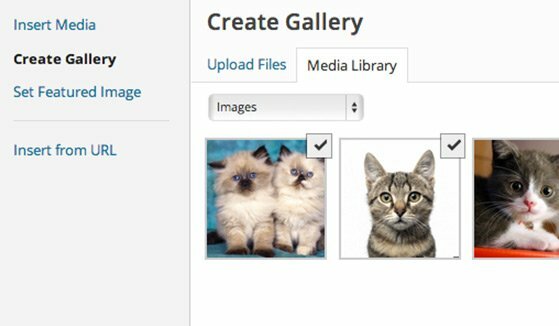 Give your images a caption and order your images by hovering over the image you would like to move–click, hold, drag and drop the image in the order you want it to appear. The ‘Gallery Settings’ gives options for how the image will display in your browser when an image is clicked, how many columns the images should appear in and displaying images in a random order each time the page is opened. ‘Gallery Settings’ are for setting how the gallery will display in your post. Once the gallery is setup the way you like it click ‘Insert Gallery’ and it will be added to your post. A preview of the gallery will show in your post editor. If you ever need to edit a gallery hover over the gallery in the editor and click the edit icon. This will take you back into the editor for further customizations.